UPDATE 15 August 2017 – Tickets are now sold out! UPDATE 30 May 2017 – Early Bird ticket offers have been extended to 16 June 2017! 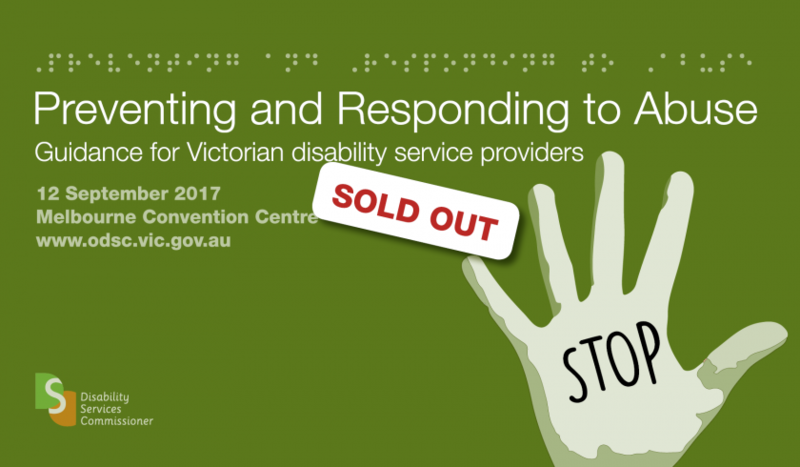 This one-day forum is a must-attend event for all those in the Victorian disability sector. The Victorian Government’s response to the 2016 Parliamentary Inquiry into Abuse in Disability Services listed a number of measures designed to strengthen the oversight of disability services as part of the transition to the NDIS (see our blog article about the response). At this forum, you will learn more about what this increased oversight will mean for the delivery of disability services and hear from the different agencies that play a part in the safeguarding system. Get in now and buy your tickets to take advantage of the Early Bird offer – ends 31 May 2017. NOTE – Early Bird offer has been extended to 16 June 2017. For more information or financial assistance with tickets for people with a disability, please contact Disability Services Commissioner on contact@odsc.vic.gov.au or 1300 728 187.